In 2010, the Institute of Plant Science and Resources (IPSR) was approved by Ministry of Education, Sports, Culture and Technology (MEXT) as “Joint Usage/Research Center” at national level. To promote research of plant genetic resources and stress science, the former department system of IPSR was reorganized to a more flexible unit structure, organized under two research cores and one research center. Each Unit is composed of several independent research Groups that are managed by nominated Group Leaders (PIs). In addition to “Barley and Wild Plant Resource Center”, two Research Cores for “Plant Stress Science” and “Future Crops” contribute to the main infrastructure of IPSR. The Research Core for Plant Stress Science consists of three research units: “Atmospheric Stress”, “Soil Stress”, and “Biotic Stress”. 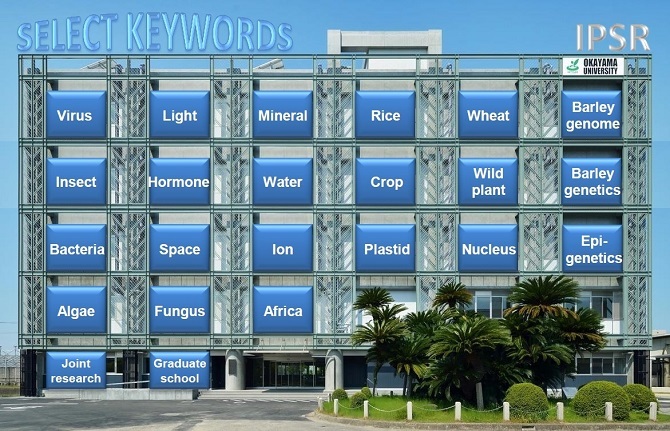 Barley and Wild Plant Resource Center is further subdivided into two units: “Genetic Resources” and “Applied Genomics”. All units collectively contribute to a large number of collaborative research programs in plant stress and development of plant genetic resources. For details about research conducted in each Research Core, Center, Units and Groups, please follow the links provided in the summary table above. For complete list of IPSR academic and research staff members in the groups, click here. The faculty members of IPSR are integral part of, and actively contribute to education at Okayama University Graduate School of Environmental and Life Science. For details related to Master (MSc) and Doctoral (PhD) course programs available at IPSR, visit our student-related pages here or directly contact the Group Leader(s) associated with the group of your interest. For general information, please contact IPSR office staff. For more summary information about research in each research group and IPSR, the most recent information brochure can be downloaded here. To see the summary of previous and current research achievements of IPSR, you can download “Annual IPSR Research Reports” from this site.